Did you survive your food coma yesterday? What is it about Thanksgiving that makes it socially acceptable to shove your face with food? Perhaps it’s because there is so much delicious food served in one day. Yes, let’s go with that. I don’t know about you, but I’m feeling guilty about all the calories that I consumed yesterday. I suppose I could have done worse. I made apple pie (coming to the blog soon!) and I only ate it for dessert. I say “only” because I could have also gobbled it down for breakfast, pre-dinner snack, or pretty much just taken a fork to the pie plate all day long. When you look at it that way, I’m winning today. 😉 Sorry, I got pie on the brain still. Can you blame me? Thanksgiving should be called ThanksForPie Day (with a side of turkey). 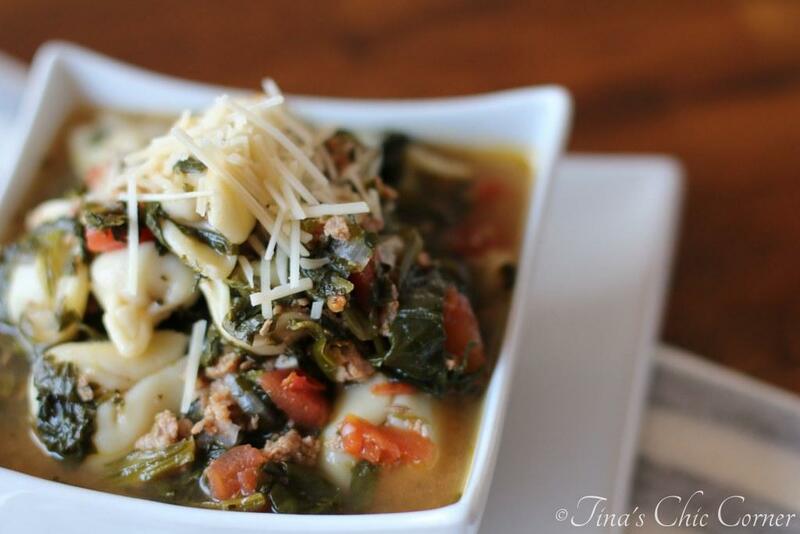 I wanted a healthy and easy soup to help ease me out of my calorie fest so I came up with this simple concoction. My husband says it’s really a pasta e fagioli. He’s right since it literally means pasta and beans. However, I made a bangin’ Pasta Fagioli Soup last year with meat and veggies in it so I can’t also call this one pasta fagioli too. 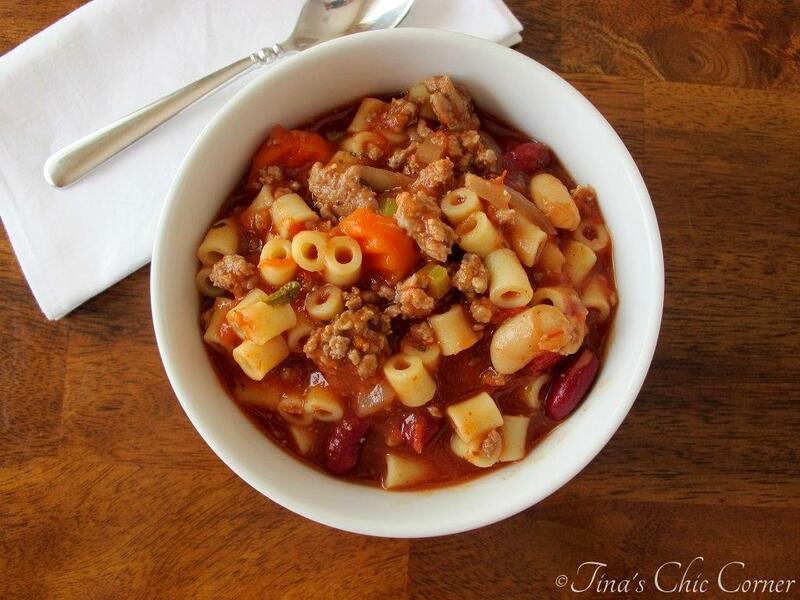 Let’s face it, there are a bazillion pasta fagioli renditions out there and I can’t call all of them pasta fagioli. Plus, this soup screams beans and pasta because that’s all it really is (hence the name). You could even take tortilla chips to this party. When I was reheating a batch the other night, my husband dunked some straight into the cold container, eating it like a funky salsa. Yup, he likes this that much. My husband and I have been having this “rosemary debate” all week. He thinks one teaspoon of the herb is enough for the pot (which is what is called for in the recipe). I think more is better. Stir in the minced garlic, rosemary, salt, and pepper and cook for about 2 minutes. Pour in the can of diced tomatoes (including the liquid), the vegetable broth, and the water. Bring the soup to a high simmer. Add in the small pasta. The pasta should be uncooked. Cook according to the directions on the box. (The Ditalini cooks for 6 minutes.) The pasta should be al dente at the end of this step. Note: This is a hearty soup so there is not a lot of broth to it. Over time the beans and pasta will soak up the broth and water. Therefore, if you re-heat leftovers (and you like a brothy soup), you may need to add more broth or water. Add as much or as little as you want, to your liking. 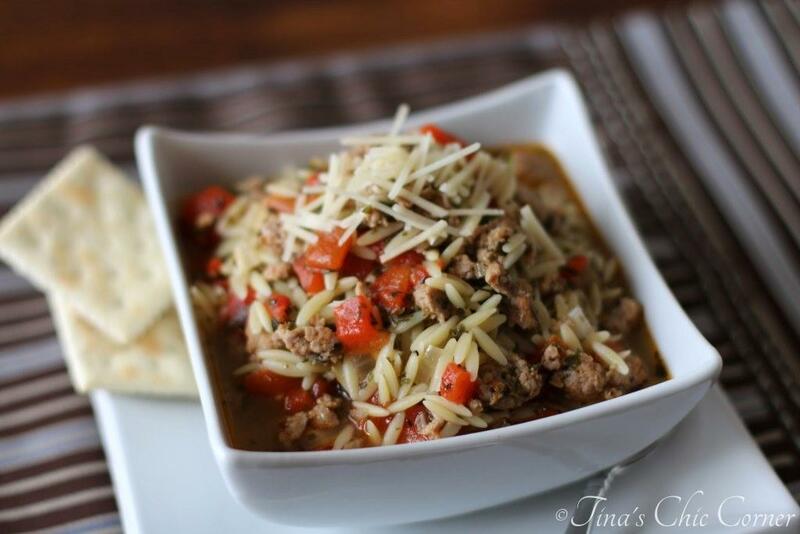 Here are some other hearty soups. Tis soup season and I couldn’t be happier! Mmm yum I love dunkable soup 🙂 The white bean and pasta combo sounds amazing! This looks a really hearty soup. Vegan and can fill my boys up. Sounds like a great easy meal. We are celebrating Thanksgiving today and as you can see I am pretty laid back about the whole thing. I best start venturing into the kitchen to start the day. I’m still in a food coma I think!! I need to try this soup – something light sounds so good to me right now after gorging myself all weekend long. Ohhh I love this! I really love white beans, I think they add such great flavor and texture! I can’t wait to make this! Used 1/2 tsp of dried thyme instead of Rosemary and added 1/2 a pound of lean ground turkey cooked with chili and garlic powder. I also ommited the onion and blended the tomatoes with the broth and water before simmering and adding in pasta. Enjoying every bite of this delicious, hearty soup right now :). Love cannellini beans. Thank you for posting.